Nice hotel, good value. Doesn't look as upscale as others but very conveniently located near the river and the night market. A tourist office inside the hotel helps you organize whatever you need to do. I have read some comments very critical of this hotel. I canonly state what we found. On arrival a the the hotel by taxi from the airport we were met by a hotel porter and also a lady who we thought was part of the hotel staff. It turned out that she was employed by a travel agency based within the hotel. Our room wasnt quite ready so we were asked to sit and wait for about 10 mins. We were immediately given a hard sell on tours in the area, very expensive ones too.We declined them all simply as we didnt like the way this had been done. The deluxe room looked to have been recently refurbished and was ecellent with all the facilities you would expect for the price paid. Breakfast was included but was very Asian orientated. Cleanliness of the room was excellent but the outside passageways were very tired. The veranda where you eat breakfast needed a good clean, especially the floor which hadnt appeared to have been cleaned for a good period of time. Overall I was happy with this hotl and its location near the river front is a good selling point. 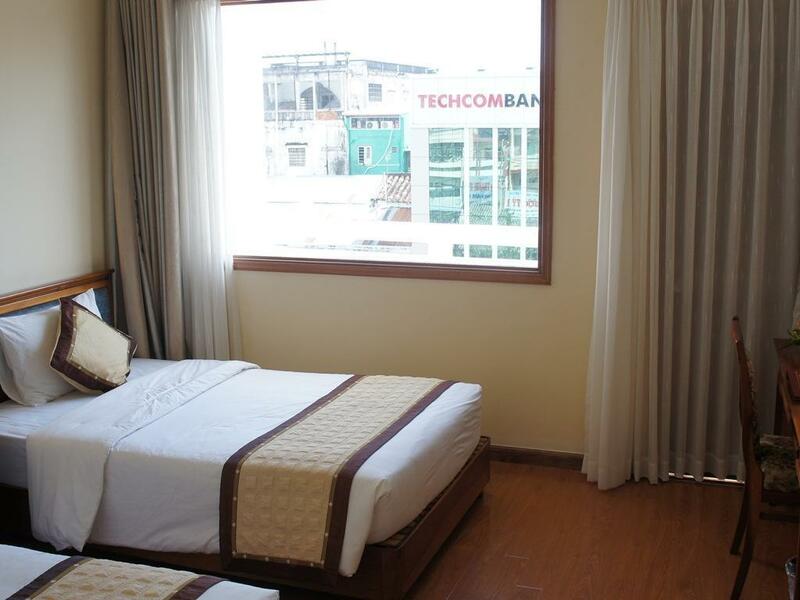 This hotel is located a couple of hundred meters from the riverfront, next to the night market. It is clean and efficient with a reasonably good ground floor restaurant and staff who speak fairly good English. Wi-fi works well. It could use more than one lift, though, and the breakfast, while adequate, is uninspiring. A safe choice, I would stay here again. 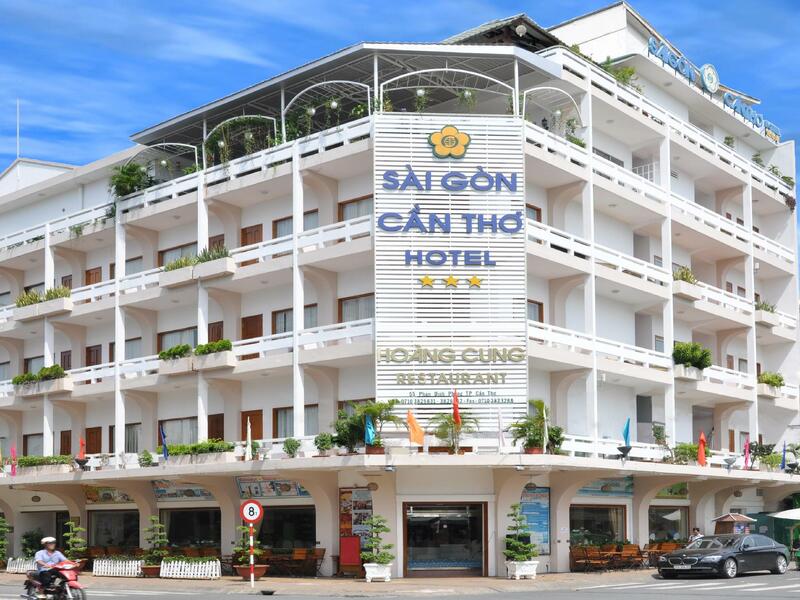 Very conveniently located where you can easily access the rest of the town and more importantly, 5 min walks to Mekong Delta for you to take your boat tour as well as the busier area of Can Tho. Rooms are adequately equipped with the necessary necessities. Rooms are spacious and have tables for you to place your stuff, but just that the air con is not ventilating very well. on arrival we were upgraded to a newly refurbished suite. the staff were friendly and informative. the hotel location was within walking distance to the restaurants recommended in lonely planet book and the can tho river. overall a great stay. we would recommend this hotel. i never can come back this hotel again. The hotel is very well run by a competent and professional management, concerned for the welfare of its customers. The front desk staff and porters are very friendly and smiling. The security staff, very respectful, always willing to help. 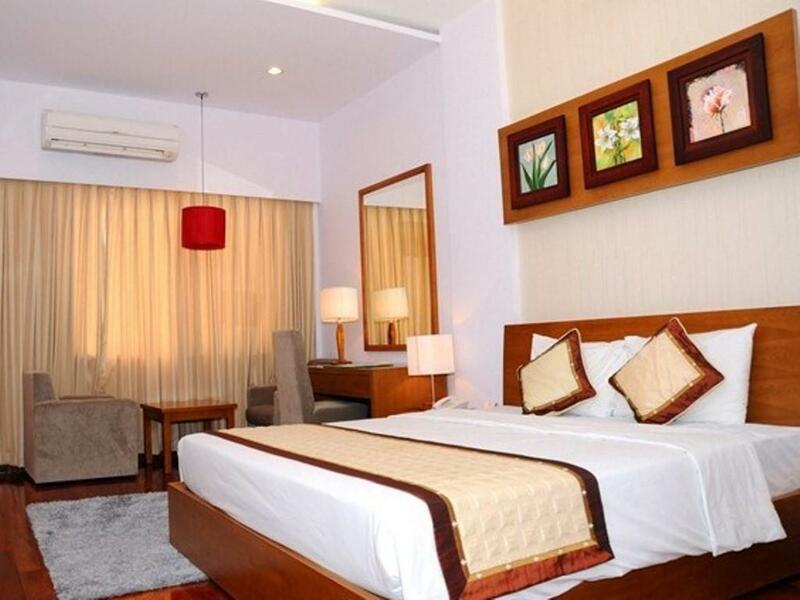 The hotel is close to everything : restaurants, shopping, walk on the pier and on the Mekong. Free parking for motorbikes and cars is available to clients. 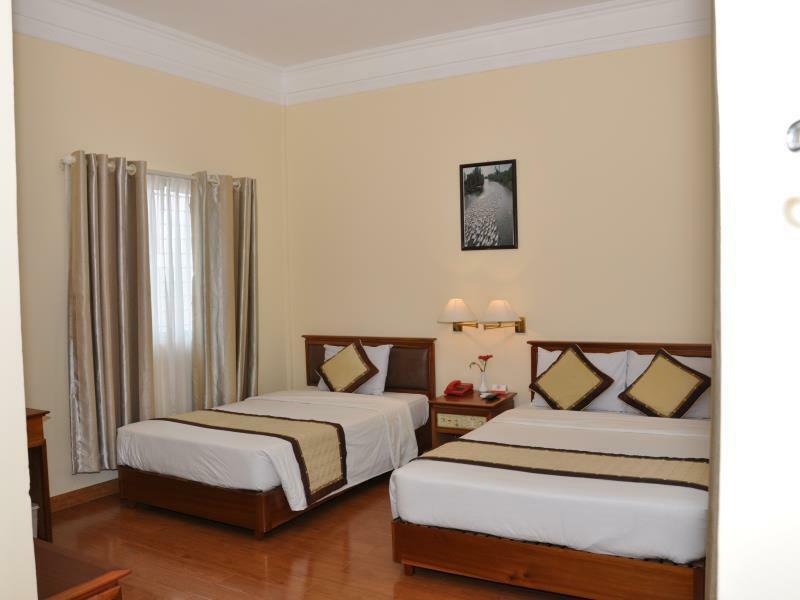 The rooms are comfortable and well maintained. Cleanliness is of a very good level. The buffet breakfast is ok. A good place to focus. A direction which should be encouraged. Perfect hotel and very friendly staff. It was the second time i stayed at Saigon Cantho hotel for my business trip in Cantho for its great location, right in the city center and its service. The staff are wonderful and helpful. Even though i forgot to tell them laundry my shirt, they still helped me out at the last minute. I'll definitely stay at Saigon Cantho hotel again. I highly recommend this hotel to everyone. Second visit to Saigon Cantho hotel, i must say it's still my frist choice for business and leisure stay as well. Staff very helpful and friendly. 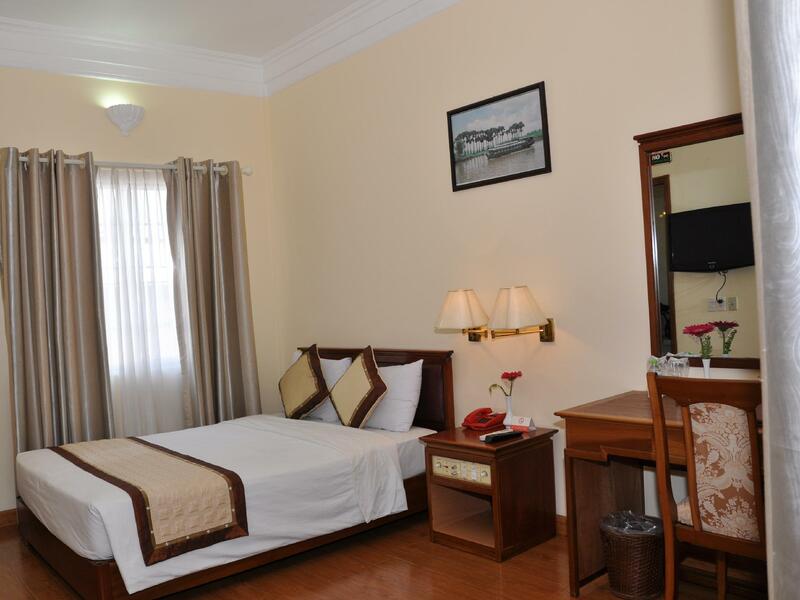 Great location, a few steps to night market, Ninh Kieu Quay and local sightseeing. Room quite small but clean and cozy. Best part was they have an outdoor breakfast. Value for money. Would definitely stay here again!! Stayed in Can Tho for a week and the Saigon Hotel was perfect for my stay. Buffet Breakfast was great, my room with a balcony was great, clean, comfortable and relaxing. Hotel staff spoke good English and were always friendly, helpful and happy. Every request was handled professionally from the moped rental to bus transportation to Saigon. The river is basically a 5 minute walk with great night life, especially if you have a partner with you. I will definitely stay here when I return in the future. the location to big shopping Centre an western movie theater. close to markets an the mekong river transport. also close location to bus station. We enjoyed our stay here with friendly money.n beautiful large room an bathroom.The buffet breakfast was very good quality An selection. I believe it to be very good value for money.I would recommend this hotel to everyone. While we were there I noticed quite a number of western businessman staying there. We had actually booked a superior room (the second lowest one) but when we arrived had been upgraded to an executive room with a balcony free of charge which was fantastic. Room was big and there was a very clean, large bathroom. Slightly noisy but we were tired so it didn't matter - comfort was our priority! Reasonable breakfast and very friendly staff who helped us organise our onward journey. Our stay here was good, fairly cheap accommodation, it was cheaper for us to book 2 rooms than have 3 in one room. good breakfast, they were renovating while we were there but that was a minor draw back. Just perfect! After exploring the town per pedes it's great to come back to a cosy room where everything works! The massage was very good and professional as well as the diverse breakfast buffet. Would go back to the Saigon Can Tho again, no doubt. Though the staff did their best to be as helpful as they could, the language barrier was always there. There were a couple of staff on the desk who had good English. The bar staff had great difficulty understanding our needs. Ut having said all that the hotel was perfect for a couple of days. Right close to the markets and the river. Would go back. Can Tho is still a developing area. For the money we paid, the hotel was okay. Breakfast is alright. We did some laundry too, it was cheap but cloth were clean. Very close to restaurant and pier, perfect for tourists who spend only a couple of days there. The staff are fabulous! Very willing to help: help us book the shuttle to bus station back to HCMC, and recommended many good places for us to go. At night, there were hawkers a couple street away selling food. Very good location for sightseeing and shopping. Hotel style is a little outdated but still OK. Room had a strange smell, it seemed that there had been some water damage. Staff was very nice and helpful. The breakfast was good offering a great variety of asian and western style breakfast. Our one night stay was a very pleasant one. The staff was extremely friendly and helpful. Unfortunately we couldn`t try the breakfast, because we went for the floating market early that morning. The rooms were very large and bright. And the welcome fruit basket was another small but effective gesture.